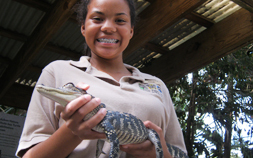 Do you know a teenager who is interested in animals and conservation? Audubon Nature Institute offers a variety of opportunities for Jr. High and High School students. Audubon's dedicated youth volunteers make our mission possible, and volunteering can be a great way to get involved in our community. Each program offers a unique adventure with memories to last a lifetime! Our youth programs include training curriculum designed to expand students’ knowledge of the natural world through hands-on learning activities, field trips and interactive sessions with animal staff. These opportunities allow students to examine various career paths as well as learn valuable work place skills including responsibility, self-confidence, accountability and public speaking. By volunteering with Audubon Nature Institute, our teens demonstrate stewardship for the environment and work together to support our purpose of Celebrating the Wonders of Nature. Are you interested in environmental stewardship and conservation of native habitats? The Jr. Naturalist program offers opportunities for teens and young adults to volunteer at Audubon Louisiana Nature Center in New Orleans East. Program participants will engage with staff and guests by assisting with reforestation projects throughout the 86-acre property, as well as introducing visitors to native Louisiana habitats in the Interpretive Center and Planetarium. Upon completion of the training program, Jr. Naturalists can become involved in Audubon’s world-class youth development program, through continuing education, special events, and service projects. 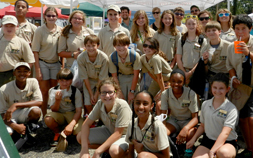 The Youth Conservation Corps (YCC Nola) is a new program created for students ages 12-19 through a partnership with Orleans Parish 4-H Foundation. 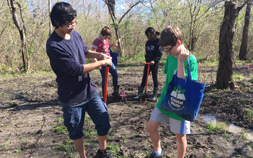 YCC Nola engages teens in conservation and community issues through various hands-on workshops and service-learning opportunities with local partners. Each month students can attend two workshops and participate in a service project with local organizations. Workshops will focus on environmental stewardship, outdoor skills, leadership and service learning. Workshops and projects will be offered throughout the summer or you can sign up for the Fall session beginning in September 2017. Eco Krewe is a leadership development program for youth entering 8th-11th grades. The program provides a year-long opportunity to experience Audubon Zoo with sessions focusing on team building, leadership, and environmental issues. Participants attend an interactive workshop one day a week, September through May. After completion of the program, participants can apply to continue volunteering with Audubon. The Jr. Keeper program encourages hands-on learning, creativity, teamwork, a sense of stewardship towards the environment and the development of work place and life skills through a wide variety of volunteer experiences. 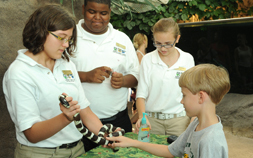 Jr. Keepers obtain experience in many aspects of environmental conservation. These opportunities allow students to examine various career paths as well as learn valuable work place skills including responsibility, self-confidence, accountability, and public speaking. A year long commitment is required. Upon completion of the first year, Jr. Keepers will be eligible for a wider range of volunteer opportunities at the Zoo. The 2019 Jr Keeper Program is open to youth entering the 7th, 8th, or 9th grade in the Fall of 2019. We are currently accepting applications until March 13, 2019. To start the application, please click here. The Jr. Aquarist program engages students through hands-on learning experiences designed to enhance their public speaking skills, knowledge of marine science and work place skills. An exciting summer training program includes field trips and other learning opportunities at the Aquarium. The program enables students to become conservation educators and share their knowledge with aquarium visitors. A year long commitment is required. Upon completion of the first year, Jr. Aquarists will be eligible for a wider range of volunteer opportunities at the Aquarium. The 2019 Jr. Aquarist Program is open to youth entering the 7th, 8th, or 9th grade in the Fall of 2019. We are currently accepting applications until March 13, 2019. To start the application, please click here. Jr. Ecologists (Formerly EcoAmbassadors) engages students through hands-on learning experiences designed to enhance their public speaking skills, knowledge of marine science and entomology, and work place skills. Participants attend a short training course to prepare them to provide exhibit interpretation and utilize biofacts and other aids to educate aquarium and insectarium visitors. During this summer program, Jr. Ecologists will develop important job and life skills, build self-confidence and earn service hours. Volunteers cultivate lasting experiences with their peers, adult volunteers, and Audubon staff.